Hjärt-centret. Luft, rörelse. Aktiverar känseln. In many traditions in our world, lighting a candle implies a sacred act, which means more than words can say; it is all about gratefulness. From time immemorial, man has been lighting candles in sacred places. Perhaps you would like to start or end your day with this simple ritual - the lighting of a candlem with attention for yourself and others. These stearin (palm oil) candles are handmade in Indonesia and produced from sustainable resources. 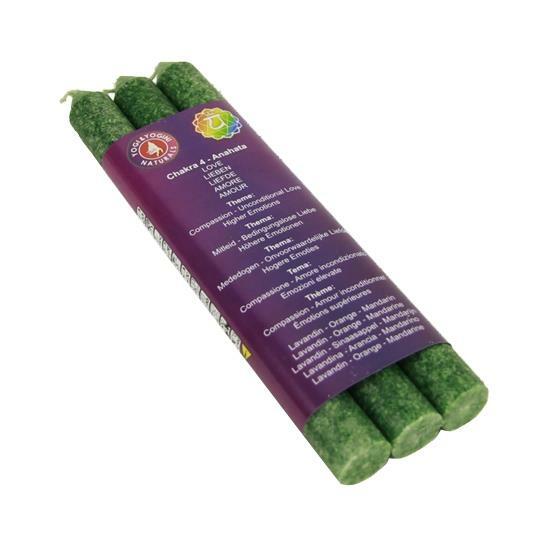 By using certified palm oil and durable packing materials, these candles are an environment-friendly product. Production of the candles is done by hand, in this way offering a guaranteed job for as many people as possible. Eighty percent of the employees are female. The company is WFTO certified. Don't place in a drafty spot, this will shorten the burning time.